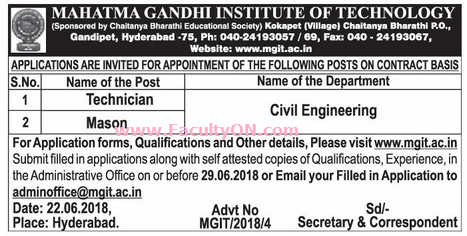 Nehru Group of Institutions,Coimbatore has advertised in the EENADU newspaper for recruitment of Technician / Mason jobs vacancies. Interested and eligible job aspirants are requested to apply on or before 29th June 2018. Check out further more details below. Salary is not a constraint for the deserving candidates. How to apply: Submit filled-in applications along with self attested copies of qualifications, experience in the administrative office on or before 29th June 2018 or Email your filled in applications to the email address given below.